Well my friends, the third and final part of our Football Friday series is here. This series has been so much fun to be apart of! We started by sharing a more stylish look, featuring a gorgeous dress by Stewart Simmons. 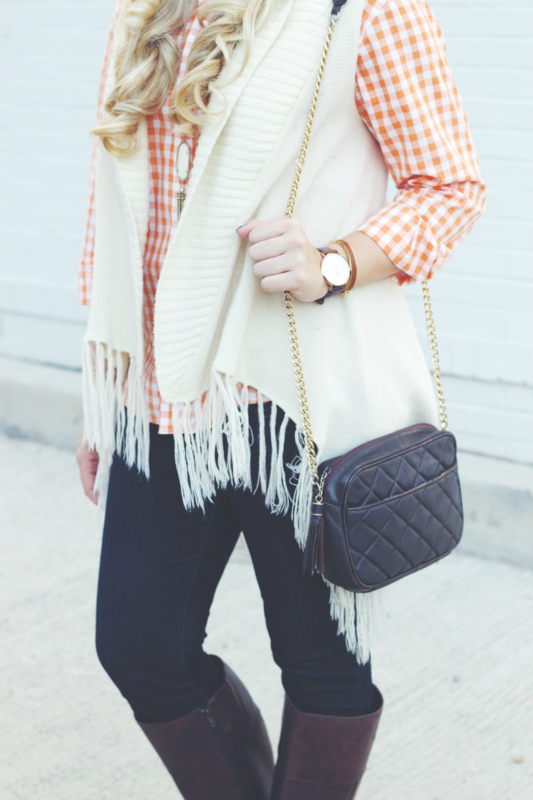 Then, we shifted focus to a casual and comfortable outfit for watching the game at a local bar or friend's house. 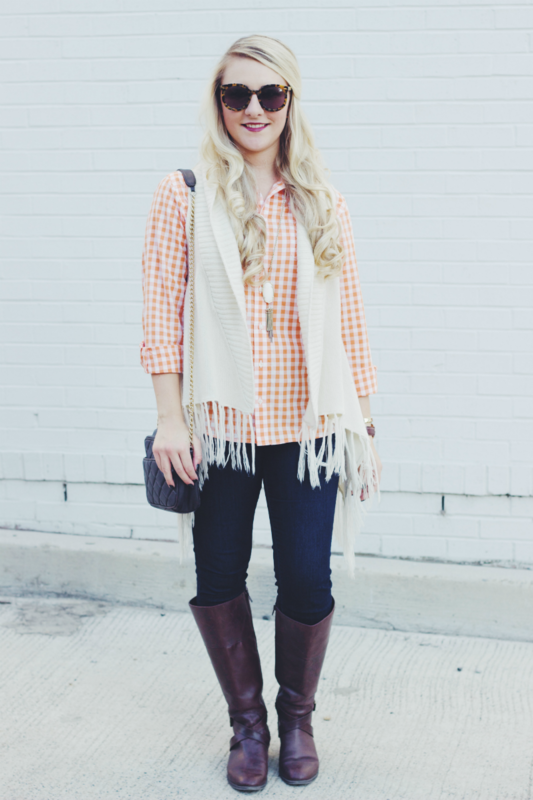 Today, I'm sharing a look for fall. Now that a new season is here, the temps are getting cooler by the week. So a layered look for an afternoon football game was definitely in order for the series finale. 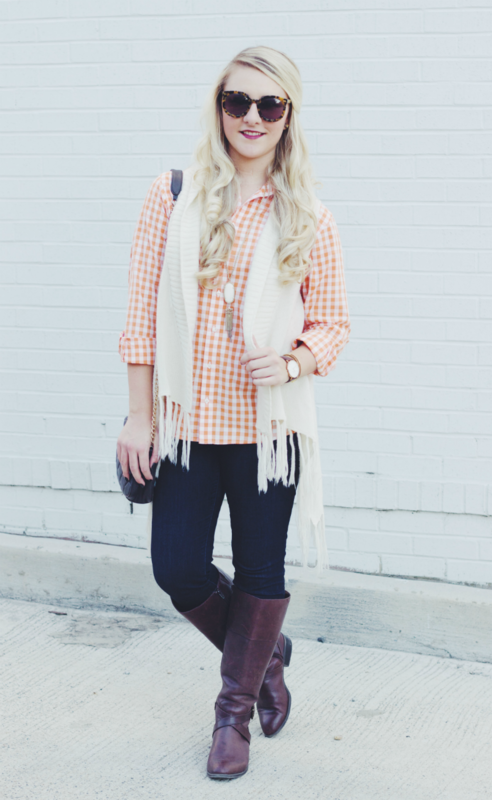 What is more Tennessee than an orange and white check pattern? Nothing! 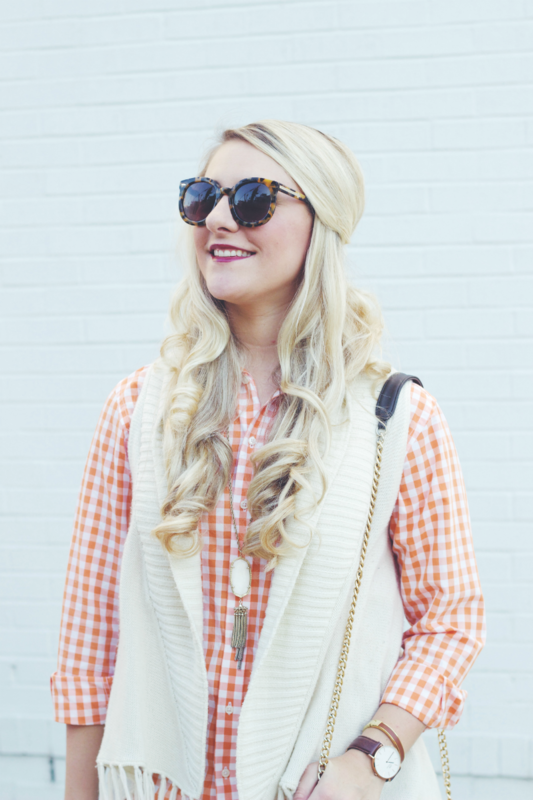 So, I found this gingham button down from Nordstrom last year and instantly knew it was perfect for football season. Sadly it has since sold out, but I found a similar option here. Since it's actually a men's shirt (make sure you size down one or two times), I wanted to layer with a more feminine piece... this comfortable fringe vest. I've had this piece for a few years, so here's a similar option. 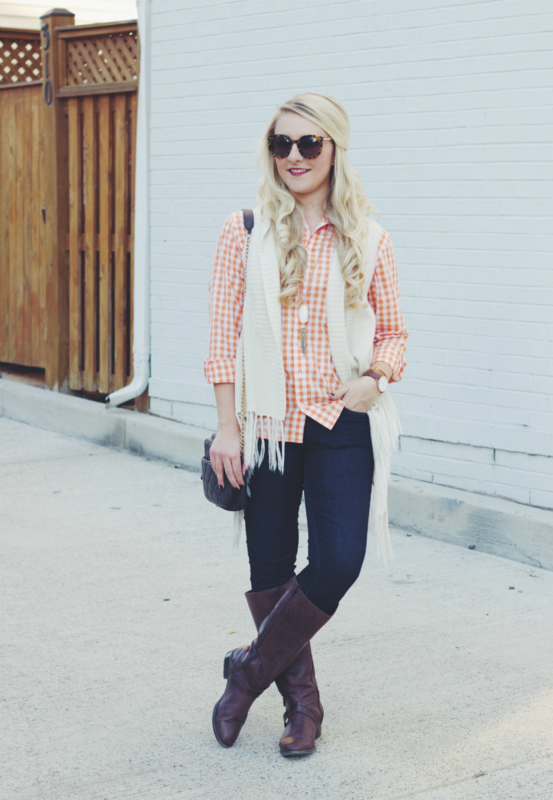 I then rounded out the look with simple accessories and comfortable riding boots. Just throw on a pair of thick socks, and your feet are toasty warm all game long. 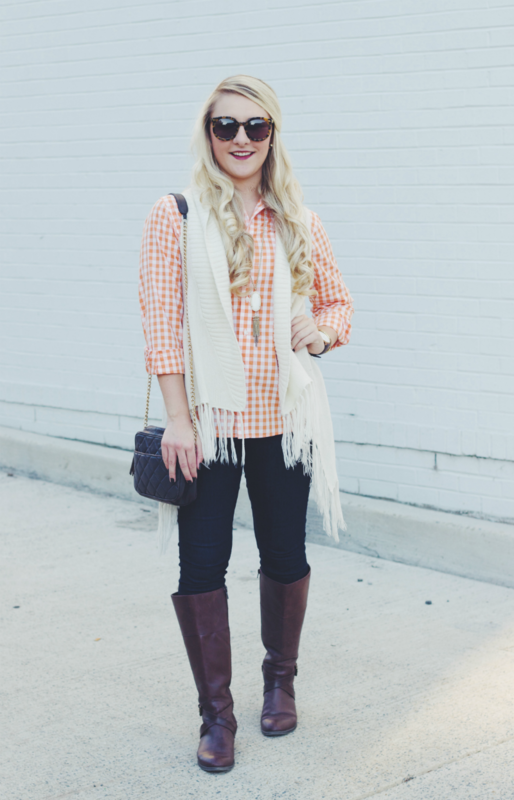 A simple, casual and comfortable game day outfit for fall! Shop the look via the links above, or widget below. On a totally unrelated note, you're probably wondering "why the silence this week on the blog?" Well my friends, I needed a breather. Not just from blogging, but from a lot of things. I did a good deal of thinking this week about what I want out of blogging, the things I want to focus my time on, etc. Basically "what fulfills me?" But, this is a post for another day. I'll be sharing more about this next week on here, and going into more detail about the future of Primp and Proper. Not to fret though... this site and blogging aren't going away any time soon. It's merely a shift in focus. Looking forward to the real and raw post I'll be sharing with y'all early next week. Till then, have a marvelous weekend and enjoy the other posts by my fabulous blogger friends as well! This series has been so much fun! 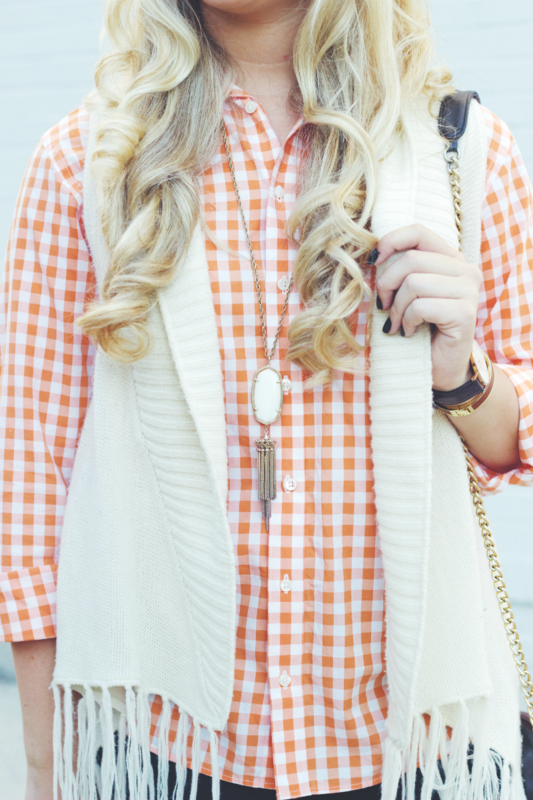 I love the fun pop your fringe vest adds to the look! Happy game day! Thanks for organizing such a fun series! 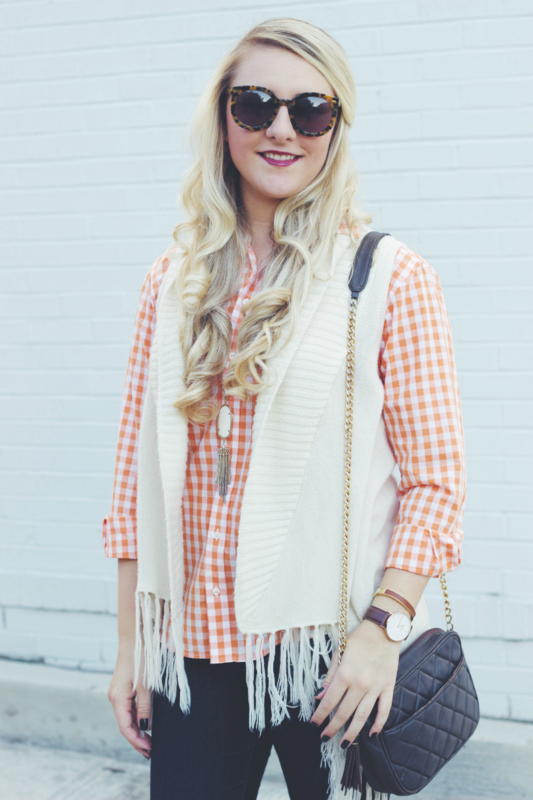 I love how you paired your fringe vest with the gingham! It really has!! So glad you were apart of it :) have a great football weekend too love!